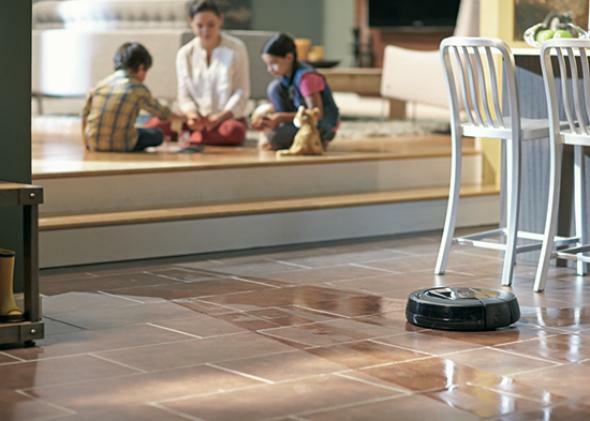 iRobot’s Scooba 450 mop: Will it really get your floors clean? The new Scooba robot promises to scrub your floors clean. Does it really work? It’s said that robots are best suited for jobs that are dull, dirty, or dangerous. Mopping a floor is without question the first two. I’d argue that when it comes to the expanse of floor beneath my bed—where dust bunnies are allowed to breed unobserved, burgeoning into a colony with the approximate texture and thickness of sheet cake—an element of danger comes into play, as well. Enter the iRobot Scooba 450. The Scooba is a Frisbee-like device roughly the diameter of a pizza. The little fellow automatically propels himself across your tile or hardwood floors, mopping them on his merry way. First, you fill the robot’s tank with water and some cleaning solution. Then you press the start button and scram. The Scooba, unattended, will perform a three-step process, covering the entire floor surface in each stage: 1) light vacuuming to pick up crumbs and such, while laying down a thin sheen of water to pre-soak stains, 2) thorough scrubbing, using a heavier dose of soapy water, 3) squeegeeing it all dry. With a triumphant beep, the Scooba announces he’s finished, at which point you can empty out the exhaust tank that the dirty water has been sucked into. The whole operation takes about 20 to 40 minutes, depending on the size of the room. It is remarkable to watch. I popped a beer, hopped up onto my kitchen counter with my feet dangling, and enjoyed the show. You keep thinking the Scooba might miss a big section, but—like its carpet-vacuuming cousin, the iRobot Roomba—it never does. It has sensors and programmed strategies to ensure it coats the whole room. You see it spiral out to gauge the size of the floor, then bump into a wall and redirect itself, and then finally crisscross the open expanses until no patches have been left unscrubbed. Is this feat worth the $600 it’ll cost you to buy a Scooba? Plus the $12.99 for each 32-use bottle of proprietary cleaning solution, which iRobot insists you choose over all other options lest you invalidate the warranty? There’s no doubt that mopping with a Scooba is infinitely easier and less messy, from the human perspective, than using a fluffy-ended stick and a bucket of gray slop water. I mean, your hands stay bone dry. You don’t even need to be at home while your floors take a bath. As for the result? Well, there’s the rub. Or, rather, there’s not enough rub. Even after the Scooba mopped my kitchen, I was able to—with a wet paper towel and just a modicum of elbow grease—scrub up a few sticky stains that the Scooba failed to dislodge. Same thing when I tried other, less obviously stained patches of floor. The proof was in the dirt the paper towel trapped after the Scooba missed it. The Scooba’s navigational skills aren’t flawless, either. The robot mop is supposed to recognize when it hits carpet so it can head the other way. But mine waltzed right up onto a rug and promptly became wedged beneath a nearby wing chair, dumping water there until I kicked it free and it at last trekked floor-ward. If I wanted something to pee all over my carpets, I’d get a cat. Due to the design of the machine’s front bumper, it also had trouble nuzzling right up to walls. It left a narrow, quarter-inch ribbon of floor next to the baseboard untouched. An iRobot representative told me that “most stains, like from dropped food, tend to happen in the middle of the floor, not right at the edge.” Which may be true. But I’d be annoyed if I hired a housekeeper and he gave up mopping before he reached the wall. Which suggests a decent analogy for owning a Scooba: It’s like having a lazy housekeeper. One who does an OK job, but you wish would apply himself more. You might find yourself re-cleaning those narrow edges that got missed. You might lament that a more vigorous effort would have beaten that Bolognese stain. On the other hand, perhaps a lazy housekeeper is better than no housekeeper at all? When I asked Slate colleagues, folks universally—and somewhat ashamedly—admitted that they don’t mop nearly as much as they feel they should. As for me: Before I sicced the Scooba on my apartment, I had previously mopped exactly zero times. In two years. Some water, soap, and a mild scrubbing certainly did my hardwoods good—even if a motivated human mopper could have done better. Depending on how often you mop, and on the going rates for housecleaning help in the area where you live, it may or may not make sense to buy a Scooba in lieu of paying for occasional maid service. But I’ll say one more thing about the robot vis-à-vis his human competitors (and I say this with very fond memories of the barely competent, once-per-month cleaning lady who gave our house desultory dustings when I was a child): In both cases, once they hang around long enough, you’ll find it hard not to grow attached. I almost immediately began to look at the Scooba as I would a pet. Its cute proportions, and the peppy way it would bounce into a wall and continue undiscouraged, made me start to root for it. Go, little guy! Look out! Oof! Good recovery! When it came time to send him into the hazardous zone beneath my bed, I felt like a World War I general sending a trembling trench soldier across a razor-wired Belgian field. The poor Scooba almost seemed to whir louder, in fear, as he encountered dust drifts and paper clips and the stray … I’m not even sure what that was. When he’d finished, he came back out covered in detritus, looking traumatized. But did he complain? Not a beep. His is not to wonder why, his is but to mop my sty.